Syracuse barely made the Field of 68 but has now qualified for the Sweet 16. How far can the Orange go? Seven days later in St. Louis’s Scottrade Center, home of the Blues, Gbinije was in a much lighter mood. He was following three-pointers with bow-and-arrow mimes. He was practically skipping off the court during timeouts. He was soaring through the lane for a tomahawk dunk and screaming upon landing, as if he knew, this time before the rest of the world, that there would be more Syracuse basketball to come. The Orange’s 75–50 win over Middle Tennessee on Sunday night was, in some ways, a predictable result. The Blue Raiders were a No. 15 seed, only one of which (Florida Gulf Coast’s Dunk City squad in 2013) had ever won a second-round game. Syracuse, meanwhile, is now heading to its 16th Sweet 16 during coach Jim Boeheim’s 39-year tenure. Yet this is perhaps the least likely such trip. Boeheim’s nine-game suspension, handed down a year ago for a slew of his program’s NCAA violations, cast a pall over the season before it even began, then threw it into disarray when the NCAA moved the forced leave up nearly a month. The Orange went 4–5 without Boeheim (including a particularly embarrassing loss to St. John’s, who then lost 16 straight, beginning with fledgling Incarnate Word). They later lost four of their final five regular season games, then their ACC tournament opener to bubble cohabitant Pittsburgh. When Syracuse was finally announced during last week’s drawn-out selection show, in the last grouping to be revealed, it was immediately seized upon by critics as fruit of the committees’ continued bias toward power-conference needle-movers, which left deserving mid-majors in the cold. In St. Louis, Syracuse responded first by throttling Dayton by 19 points, then smothering Middle Tennessee. In doing so they dispatched the second round’s most surprising guest in a weekend overrun by them, following this tournament’s cruel trend of sending Cinderellas home after their second night at the ball. Forty-eight hours earlier, the Blue Raiders had dunked and three-balled their way into the nation’s heart, bouncing popular title favorite Michigan State, which was led by a March legend (coach Tom Izzo) and the potential national player of the year (Denzel Valentine), with stunning verve and athleticism. Apparently overqualified for their seeding, they nonetheless proved well-cast for March darling status (stocky bomber Giddy Potts, a reluctant but endearing media magnet, will not soon be forgotten), and spoke so earnestly of their continued confidence that one did not dare rule out a repeat performance. • MORE: What can we predict about the Sweet 16? Meanwhile Middle Tennessee’s three-point shooting, which had torched Michigan State at a 57.9% clip, went cold and quiet, run off the line by the Orange’s long and aggressively closing defenders. Shots that did get up rimmed out. Passes bounced off hands. When sophomore guard Quavius Copeland hit a three that would have cut Syracuse’s lead to five with 6:21 left in the first half, officials waved off the bucket as a shot-clock violation after a lengthy replay review. It didn’t to be the Blue Raiders’ day. Still they clung stubbornly to Syracuse’s heel, entering halftime trailing only by four. The second half opened with what passed for a Blue Raiders run: consecutive threes by Jaqawn Raymond and Potts that gave Middle Tennessee its first lead since the game’s third minute. Gbinije responded with a cutting reverse layup, and soon the teams were trading buckets in a tight game that seemed poised to mold into Friday’s stunner’s worthy heir. It would not last. Just past the 15-minute mark, Raymond—Middle Tennessee’s point guard—picked up his fourth foul. Over the next eight and a half minutes, played almost entirely with Raymond on the bench, the Blue Raiders scored just two points and fell behind 61–41. (A seven-minute drought ended when a returning Raymond connected on a three.) The Orange began draining jumpers, throwing down alley-oops. They looked the part of an ACC contender, even if they had not been. Middle Tennessee never again came within 20. • MORE: Is Gonzaga's Sabonis the best post player in the Big Dance? Down the hall, the Syracuse locker room was upbeat but calm. 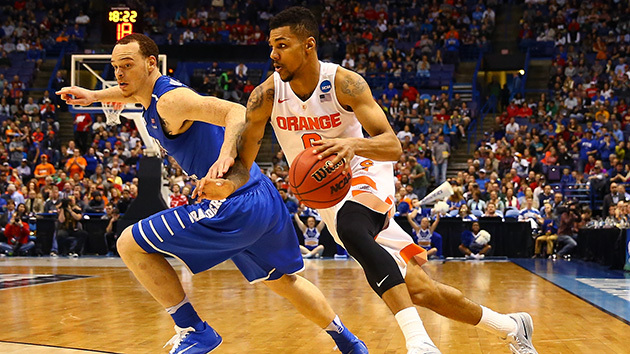 The Orange’s two standout senior guards, Gbinije and Trevor Cooney (who on Sunday scored 23 and 12 points, respectively) have each been to the tournament twice before, though never in significant roles on a team that had seen its second weekend. Ditto Tyler Roberson, the team’s talented but unpredictable junior forward, who had come alive for 27 rebounds during Syracuse’s two wins. For two other key contributors—freshman forward Tyler Lydon, who scored 14 against Middle Tennessee while anchoring the zone, and classmate Malachi Richardson, whose three-pointer kicked off Sunday’s decisive run—the experience was entirely novel. Even for Mike Hopkins, a player on Syracuse’s 1990 Sweet 16 team and now an assistant coach on 10 more, this trip stood apart from the others. A year ago, when the Orange had self-imposed a postseason ban ahead of impending NCAA sanctions, Hopkins skipped the annual coaching convention during Final Four weekend in favor of a five-day trip to the Cayman Islands with his family. “I just had to get away,” he said Sunday. Since then he served as an emotional fill-in while his boss and mentor served his suspension, then sweated weeks of speculation about whether the team’s pair of swoons would cost it a return to the tournament.